Center for Hospice Care (CHC) was thrilled to honor Sister Carmel Marie Sallows C.S.C. during its 34th Annual Helping Hands Award Dinner on May 2, 2018. In addition to the Award, CHC created a special fund to honor Sr. Carmel - a fund that will support CHC's promise that no one eligible for hospice care will be turned away, regardless of their ability to pay. Center for Hospice Care's 34th Annual Helping Hands Award Dinner was held on May 2 at the Hilton Garden Inn in South Bend. Each year, Center for Hospice Care (CHC) honors a deserving recipient with its Helping Hands Award. CHC was thrilled to honor someone who has faithfully served the community for more than 60 years – Sr. Carmel Marie Sallows C.S.C. Nearly 400 generous sponsors, supporters and friends of Sr. Carmel came together to celebrate her life of service, and to raise $191,650 to help CHC deliver compassionate care to all eligible patients and families. "I am always amazed at the level of generosity of this community," said Mark Murray, president/CEO of CHC. 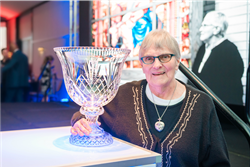 "Honoring Sr. Carmel, who has helped so many was a true privilege for CHC. We're so grateful to her for her lifetime of service, and to those who have contributed to our charity care efforts." To further honor Sr. Carmel, CHC created a permanent fund called the Sister Carmel Helping Hands Fund. The establishment of this fund also gave those who were unable to attend the event an opportunity to honor Sr. Carmel. To date, the Sister Carmel Helping Hands Fund has raised $99,585. In just the last four years, CHC has provided nearly $8 million dollars in charity care, discounted care, write-offs, and unreimbursed services. CHC is proud to give back to the community, and the dinner proceeds combined with Sister Carmel Helping Hands Fund will help support those efforts. For more information, please visit foundationforhospice.org. Established in 1978, Center for Hospice Care is an independent, community-based, not-for-profit organization, improving the quality of living through hospice, home health, grief counseling, and community education. With offices in South Bend, Plymouth, Elkhart, La Porte and Mishawaka, CHC serves Elkhart, Fulton, Kosciusko, LaGrange, LaPorte, Marshall, Porter, St. Joseph and Starke counties in Northern Indiana. The Hospice Foundation is committed to supporting the work of CHC through community outreach and education, fundraising activities and other special events. The Foundation helps CHC keep its 38-year promise that no one eligible for hospice services will be turned away, regardless of their ability to pay.